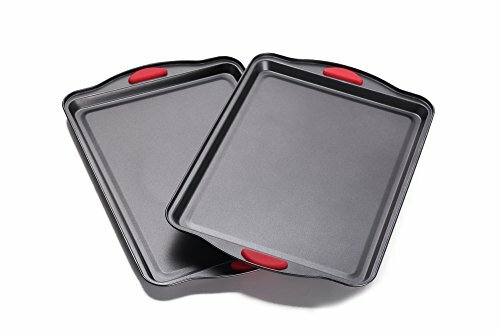 Nonstick cookie sheet set of two with silicone handles for easy grip. Heavy-duty non-stick coating for trouble-free baking and easy cleaning and drying. Perfect for personal use as well as a gift to friends or family for home baking. Ideal as starter kit for children and beginners. Essential item for experienced and professional bakers. Modern look, scientifically designed for optimal performance. Easy to handle, space saving, elegant packaging. Perfect for baking cookies, biscuits, macarons, oat bars, brownies, swiss rolls, cinnamon rolls, pastries, biscotti, croissants and baking other items. ✔ HIGH QUALITY Nonstick cookie sheet set of two with double layered non-stick coating inside and outside. BPA free Silicone handles for easy grip. Novel design with curved corners for hand safety. PTFE and PFOA free non-stick coating for a healthier approach to bakeware. ✔ CONVENIENCE OF STORAGE AND RIGHT FOR ANY AGE Convenient size 15" x 10" x 0.75". Oven safe to 500 degrees Fahrenheit. Most optimal weight for regular household baking. Most ideal for young hands learning to bake for school projects and for fun during holidays. Well-rounded corners and BPA free silicone handle for safe handling compared to other products. Ideal for children to start baking during school holidays. Popular gift for any occasions. ✔ ORDER NOW WITH NO RISK! 100% SATISFACTION GUARANTEE. Order this EPIC ITEM NOW with peace of mind. No questions asked Money Back Guarantee. Click the "ADD TO CART BUTTON" NOW! If you have any questions about this product by Home & Kitchen Group, contact us by completing and submitting the form below. If you are looking for a specif part number, please include it with your message.